Welcome back again everyone. We have finished our other two comic reviews, so it is time to shift gears from one friendly neighborhood comic store to another. The next two reviews come from the wonderful guys at Vibranium Comics and Games also in Ocala, Florida. Be sure to check out their facebook by clicking the banner below. Now I hate to say this, but this first review is most likely going to be a very quick one so hold onto your hats boys and girls as we speed right through this. Our first review is for the new Adventure Time Marcy and Simon book that’s out from Boom Studios. From what I have seen this is supposed to be a six issue limited series so if you like the show be sure to run out and get this. So here’s the thing and why this will be so short. Austin gave this to me and said I should like it because he and I have similar tastes in humor. There’s a problem though…this comic follows the show with some of its characters who I gather are main characters in the show other than Jake and Finn however I have never watched the show so I wouldn’t know. I was just never interested in the show because and I will admit this I am an animation snob and that style to me just looks stupid as hell. I mean who knows the comedy might make it worthwhile for me but the animation style turns me completely off. Also, the book wasn’t funny to me, it was kinda serious in its sound. Who knows maybe I missed some of the jokes by not watching the show but for the most part to me, there was little humor in this comic. To be honest to me this felt like another Over the Garden Wall fiasco where you have to be a fan to really get the comic. Now considering I watched Over the Garden Wall to see if I would understand the comic and I wasn’t thrilled with it it makes me hesitant to watch this one to see if I get the comic better, especially since I was much more open to the animation style of Garden Wall than I am for Adventure Time. Not to mention that Over the Garden Wall was like 12 short episodes if even that and Adventure Time has several seasons…not sure I could get through all of that. So to sum up: I didn’t enjoy it but I have no real grounds to base my opinion on in the first place so it’s not really right for me to say “Don’t get it!” as someone who does watch the show would probably enjoy this. So, for now, I will just put here that this wasn’t my cup of tea and be honest that for me who knows nothing of the series it was a waste. Again though, if you are a fan of the series be sure to check it out and let me know below if you liked it as I would love to know what others thought of it. So there you have it this once again proves I don’t just give glowing reviews to everything because I work with the comic shops to bring these to you. I will always give my honest opinion and let you know why, unlike other sites that get paid for nothing but glowing reviews. If you enjoy my honesty and would like to see us branch out more to toys and such then feel free to buy some of our stuff once we open our store or drop by Ko-fi.com/thalra to support us. Everything we make on geek merch and donations will go to making sure we bring you quality content more and more often! Wow, I was actually expecting for them to do Shermy and Beth but this is even better!? 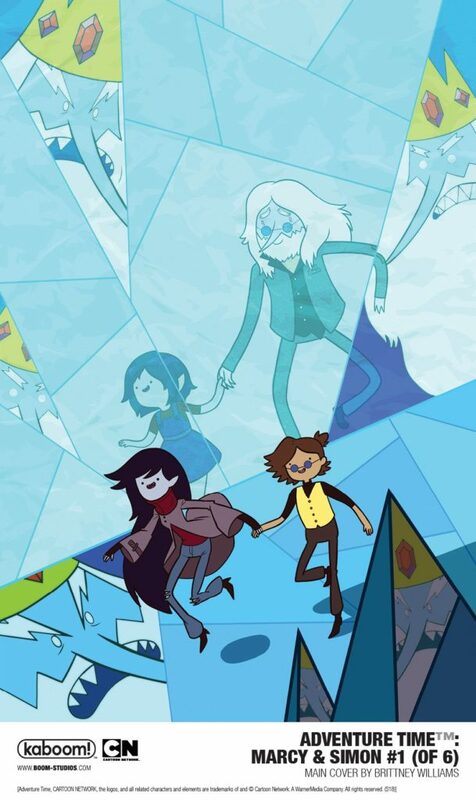 Marcy, and Simon are great. They should also do a comic book series about the penguins.? You should do a blog about Total DramaRama topping Teen Titans GO in the ratings. I want to hear your thoughts on it?. Oh gods I won’t go near Teen Titans Go with a hundred foot pole. I wasn’t a fan of the first TT show but GO went way beyond bad to me. In my opinion they should have done with the titans shows what they ended up doing for Young Justice….but I’m biased on this because I always LOVED the Teen Titans comics which are a lot more serious than this show has ever been!